The back of our hand to their froward ways. Purists! Yeah, sometimes. We like rectangles. A square is a kind of rectangle, as we’ll sometimes remind them. We try not to get superstitious about Number, hard as that often is. There’s nothing particularly sacred about a ratio or counting system outside of its relationship to man – our math is on the via negativa. As Sam Cooke put it so well, “Don’t know much about Algebra, Don’t know what a slide rule is for….” The things we don’t know are way more important than the ones we think we know. Well, this is from a square. 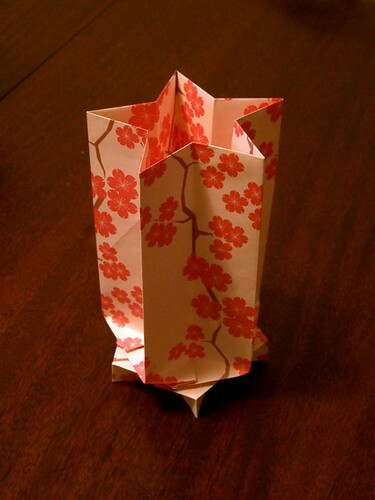 And after you fold one, you’ll realize you could make this from any size rectangle. Feel free, this piece is itching for variation. And we have some more ?-quiddity, here. The folding sequence in steps 1-5 of the SCP, the one by which we approach a 54° angle, is reverentially lifted from Kunihiko Kasahara’s Amazing Origami. The cherry blossoms on the model above are a visual pun on the ?-love inherent in the piece. This entry was posted on Saturday, January 7th, 2006 at 5:01 pm	and is filed under content, creative commons, square, star, twist. You can follow any responses to this entry through the RSS 2.0 feed. You can leave a response, or trackback from your own site. Sadly the link to the A4 CP is sending me to a 404 error page. Please, if possible, fix this as I’d love to make this. All set — thanks for catching that. what does the circle mean in the sequence file? It means, note this intersection. Nothing standard about this, I just find it a handy symbol. Love this vase! But I wasn’t able to finish it. Until now! I was stuck in step 26. Then while I was writing this comment I figured it out how to finish it! I’m so happy! Ok, the first one is far from being acceptable, but now that I know how to do it I’ll try again. Thanks for the CP. cute vase, with a few modifications and two rather than one I found it makes for a very pretty candy box ^_^ I’m in the process of making up a couple hundred of them to use as favors in my wedding, its tedious, but I think it will be pretty unique! thanks! A couple hundred? Geez! I find one hard to complete. Nice mod. Good luck with the project.